The Center for Medicare Advocacy can supply selected brochures and booklets on the various aspects of Medicare in our "topics" section, in addition to the items available online, below. For more information and to order, call 860-456-7790, or click on hyperlinked items (blue, underlined, "clickable") items below to purchase online by credit card . The Medicare Handbook – We literally wrote the book on Medicare. Available from Wolters-Kluwer publishing. 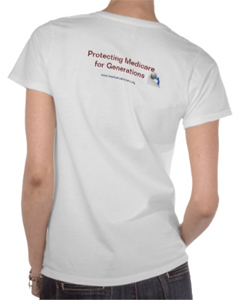 Support the Center with our "Protecting Medicare for Generations" T-shirt! on a wide array of topics. Please email us to request further details, information on scheduling and information on rates for any of the topics listed below. Copyright © by the Center for Medicare Advocacy, Inc. All rights reserved, including the right to reproduce these materials or portions thereof in any form whatsoever. For more information address the Center for Medicare Advocacy, Inc., P.O. Box 350, Willimantic, CT 06226 (860) 456-7790. * Single copies of brochures and handouts are free to Connecticut beneficiaries and their families. Due to budget constraints, the Center must charge for bulk orders and professional use.